Connect Pump - SHIPS FREE! 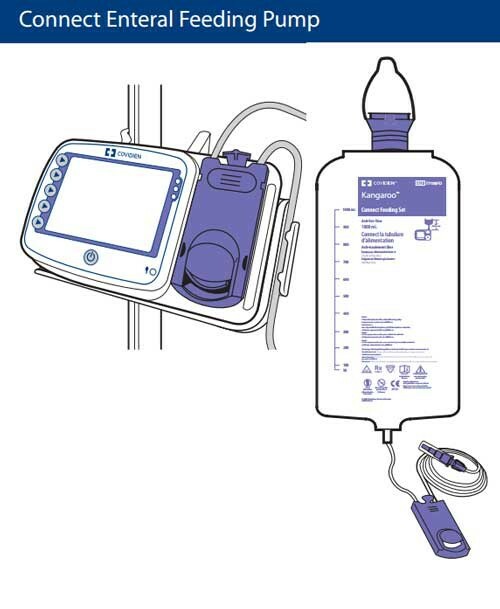 Kangaroo Connect Enteral Feeding Pump is manufactured by Medtronic, formerly Covidien. 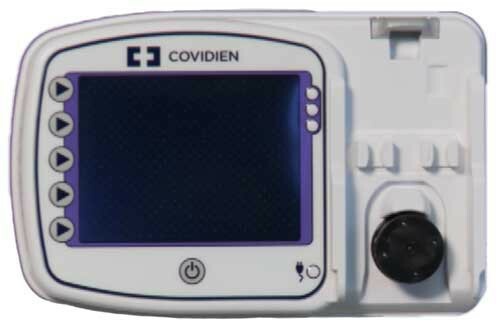 The Connect Pump is a portable rotary peristaltic enteral feeding pump that provides enteral feeding to nutrition patients. 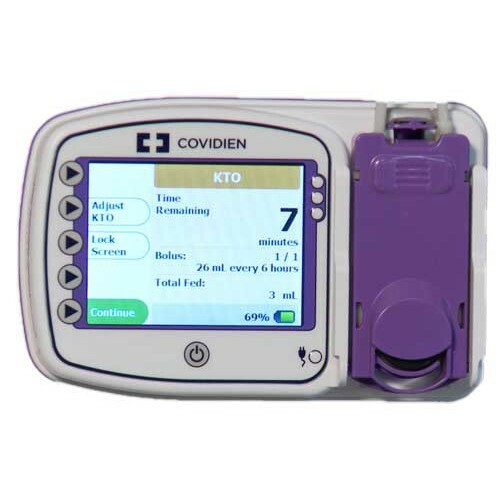 This enteral pump can be programmed to provide patients with continuous, dose, or bolus feeding when used with Kangaroo Connect Feeding Sets. 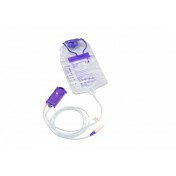 Kangaroo Connect Pump is designed for use in acute care settings as well as home care use. This waterproof pump offers simple on-site re-certification. Its compact design is lightweight and portable. 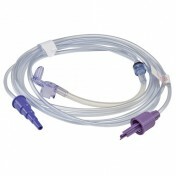 The Kangaroo Connect Feeding Pump may be used for both stationary and ambulatory patients. This is the most accurate Kangaroo Pump currently available. 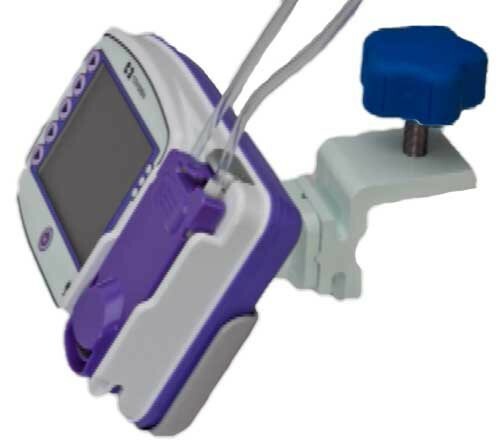 The Kangaroo Connect can be used for both adult and pediatric patients as long as the patient can tolerate its flow rates and accuracy level. Other Kangaroo Pump Sets available at Vitality Medical include the ePump, Joey , and the 425 pump. Waterproof to industry standard IP26 (IPX6). Notifications on full color screen. Portable easy release pole clamp. Type Infusion Device: Volumetric Enteral. Service Life: 5 years or more. Feeding Formula Delivery Rate: 1-600 mL/hr in 1 mL increments. Formula Dose: 1 - 3000 mL in 1 mL increments. Bolus Volume: 1 - 3000 mL in 1 mL increments. Number of Boluses: 1 – 99. Bolus Interval: 1 - 24 hours in 1-hour increments. Accuracy: 5% or 0.5 mL/hr, whichever is larger, for all delivery rates no matter the type of Kangaroo Connect feeding set. Power Output: +5 V, 4.0 A. Battery Duration: 24 hrs of battery life at 125 mL/hr feed rate (when using the Power Save Mode). Alarms: System Error, Feed Bag Empty, Supply Tube Blocked, Patient Tube Blocked, Cassette Dislodged, Cassette Error, Rotor Stuck, Dead Battery. Notifications: Feeding Complete, Feeding Incomplete, Low Battery, Pump Inactive. Product Overview offers basic information about this Kangaroo pump. Kangaroo ConnectOperator Manual includes setup, care and maintenance instructions. Kangaroo Connect 38440 Specifications contains key specs for this product. Cleaning Instruction offers important information about caring for you new pump. Alarms and Troubleshooting tells you how to keep you machine operating properly. Product Warranty includes details to submit a warranty claim. Before you begin using the pump, you'll need to be sure that it is fully charged or connected to a power supply. Plug the power adapter into the power adapter port, located on the left side of the pump. Plug the other two-prong end of the power adapter into the AC outlet. Check to see that the AC indicator light is on to confirm that the pump is receiving power from the wall outlet. Be sure to charge the pump for a minimum of seven hours before initial use. The device can be connected to a vertical pole using the pole clamp included with the pump. Tighten the knob, so the pump does not slide down the pole. The plastic retention plate is designed to be rotated in 90 degree increments to allow attachment to a horizontal, table-top surface; or a horizontal bed-rail. Rotate the latch-plate connector, to look like an upside down letter "U." Match the "U" and the back of the pump with the pole clamp latch-plate and slide the pump down until it has been properly seated. To remove the pump, gently pull upward on the pump until it pops upward off the latch plate. Hang the prepared set-bag, or fluid container, so the starting volume of fluid is ten inches above the top of the pump as shown. Press the power button centered below screen to power-up the pump. If you have used the device previously, you're last settings are automatically retained in the device's memory. Press "Keep Settings" to keep the settings from the last usage. Otherwise, press "Clear Settings." Next, you'll see the "Load Set" screen. Follow the animated instructions on the screen; sliding the bottom pegs of the cassette into the slots, then locking the top into place. 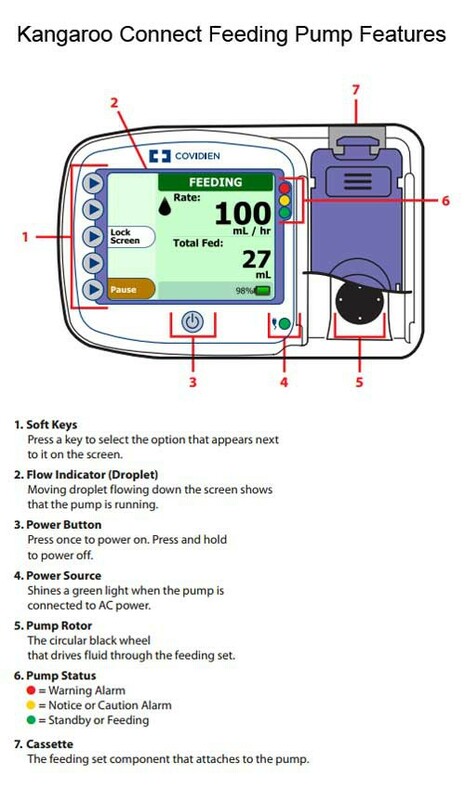 The "Set Loaded" screen will confirm that the pump has properly identified the feeding set. Hang the bag with the fluid level 10" above the top of the pump. You are now ready to prime. You are now ready to prime the set. Press the "Prime" button to continue. Note the warning on the screen. Select "Auto Prime" to automatically prime the set. The pump will show an animated timing sequence, indicating the prime is in process. Wait for the priming to complete. Once the auto price is complete, the solution will stop short of the feeding set connector. To top off the tubing, press and hold the "Hold to Prime" button, until prime is complete. To continue, press done. If desired hold to prime can be used for a manual prime. Press and hold the "hold to prime" button to begin the manual prime. Press "done" when complete. To prime the set, always disconnect the tube from the patient. Then, select Auto Prime or Hold to Prime. Complete priming by using Hold to Prime to top off the set. Press "Done" to complete and "Start" to begin feeding. Remember - Never Prime the Set when the tube is connected to the patient. Upon completion of the prime, the "Ready to Feed" screen will appear. Press "Adjust Feed" and "Adjust Rate" to enter the feeding rate. Press the plus or minus buttons to increase or decrease the rate. Push and hold on either button to accelerate the numbers. Press "ok" when finished and "done" to return to the screen. The screen should now say "Ready to Feed." Confirm that the rate shown, matches the rate prescribed. Once confirmed, press the "start" button to begin. Once started, you must press the pause button to change settings. More options: to access the features of "clear amount fed," "airplane mode," and "view history," "adjust brightness," or to re-prime the pump, press the more options button. Use the arrow keys to highlight the feature you want to activate. Once highlighted, press the select button to activate the highlighted feature. A check mark should appear next to the feature. Press the back button, and then continue to resume feeding. Additional information is available in your operators' manual. The "Dose" feature is used to establish a fixed volume of formula to be delivered to the patient, one time. Once the dose limit is reached, the pump will stop operation with feeding complete, but will not sound a feedbag empty alarm. This is especially useful for nighttime feedings. From the screen, pause operations if the pump is feeding, select the "Adjust Feed" button. If the dose feature has been enabled, the adjust dose button will appear below the adjust rate button. Press the adjust dose button to set the maximum amount of feeding solution to be delivered. Select ok, then done to return to the screen. Select start to begin feeding. If the select dose button does not appear, you will need to enable the dose feature. See advanced settings to enable the dose feature. 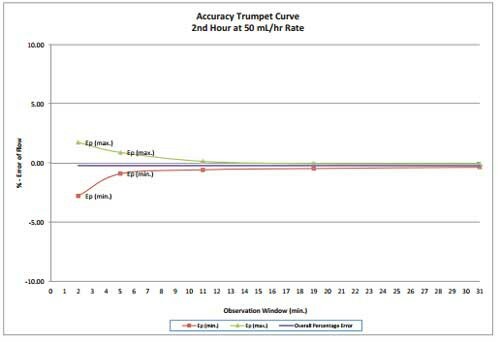 Remember - Rate is the volume to infuse over time in mL/hour. 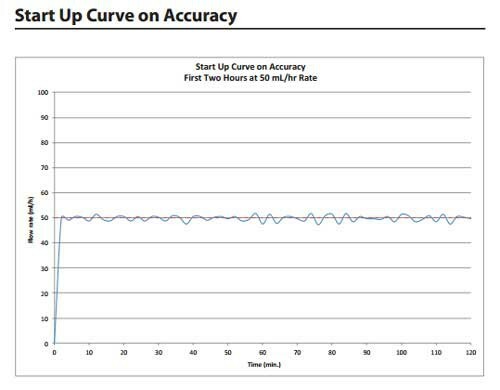 Dose is the total volume to be delivered in a 24 hour period. Each time you power on the pump, you will select keep or clear settings. If you have already primed the set, select "Skip Prime" when prompted. Adjusting bolus – the bolus option allows you to enter a fixed amount of feeding solution to be delivered to the patient, repeating in a fixed interval. Select "Adjust Bolus." Press each of the option buttons to input the rate, boluses, volume and interval; after each item has received input, press done to activate. Press start to begin. 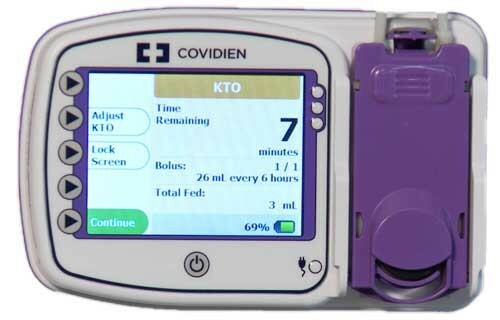 KTO is the keep tube open feature for the pump. 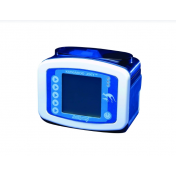 This feature allows you to temporarily pause operation of the pump while allowing a very small amount of formula to flow through the feeding set. See the operators' manual for exact amounts. The KTO screen will show a countdown until feeding resumes. Activate the KTO feature during the feeding cycle by pressing the "KTO" button. The feeding will be paused. You may adjust the duration of the KTO session on this screen. When finished, select "OK." To un-pause and resume feeding, select "Continue." Temporary lock screen - The pump allows the user to lock the input screen, to prevent accidental button pushing during portable use. This is especially helpful when transporting the pump in a backpack. From the screen, press and hold the lock screen for five seconds. A countdown will appear to show how long to hold the button. Once activated, a lock symbol will appear on the screen, showing that the buttons are disabled. To disable the lock screen, so that buttons can be activated, press and hold the "unlock" button for five seconds. The buttons will now be re-enabled. Please see the operators' manual for complete cautions, instructions, and appropriate cleaning solutions. It is recommended to be cleaned after each use, to prevent bacterial contamination. Further, failure to clean the pump can interfere with the function of the roller, which can increase the occurrence of errors and warning alarms. Always clean and/or disinfect the device after each use, when these devices are used for multiple patients. This is to prevent spreading bacteria, viruses and other germs between patients that interact with the device. Directions for Cleaning the Pump Housing - Clean the outside surface with a damp cloth or sponge. For difficult to clean areas, it is permissible to wash the pump under running water. Avoid submersing the pump and washing with high pressure nozzles. Directions for Cleaning the Power Adapter - Unless soiling is observed, the power adapter should not be cleaned. If cleaning is necessary, unplug from the outlet and wipe the exterior surfaces of the wall plug with a cloth dampened with isopropyl alcohol. The pump status LED indicator lights on the upper-right of the pump face, give a quick visual indication of the pumps status, especially in darkened rooms. A solid green light indicates that pump is feeding. A blinking green light indicates the device is ready for operation, but not feeding. A solid yellow light indicates an informational notice. A blinking yellow light indicates a caution. A blinking red light indicates a critical warning. Worst pump ever. Alarms go off constantly. Wouldnt wish anyone to have this pump. I've only owned it for 4 months and im so sick of it. I tried calling to get my pump returned and refunded with absolutely no luck. It's ridiculous. Im very unsatisfied with this pump. I've also sent it in for repairs a few too many times. Same problem every time. I hate this pump. The alarms go off every two minutes or so. It says that the tube is blocked when it isn’t. It doesn’t tell you how long before the next feeding. It doesn’t fit well in the g tube backpacks. It is difficult to stop and restart the pump meaning I have to go in and reset ALL the settings in order to restart or change it to get it back on schedule. This pump is preferred over the old e-pump. The Connect pump has greater functionality. Glad we brought it in. This product is so much easier to use than our previous pump.